Monday Night: The only Night I cover.... These are the voyages of the Graveyard shift...Hosted by Kotaku's reader-run blog, TAY. Its continuing mission: A place to talk about anything. So feel free jump in the ice breaker topic or not ¯\_(ツ)_/¯ Maybe check the random blips of TAYCLASSIC. Either way, this is for you! The Late Night/Early Birds/ Old-World/ Citadel Shoppers/Sickbed /Office Drones/ All-Nighter future warriors! Actually, you know when you watch or hear about a show, you feel as it won't be something to get into. And month or in some instance years later you watch it, and you just love it? Yeah that was me, and my bro with ST:TNG until we got netflix. 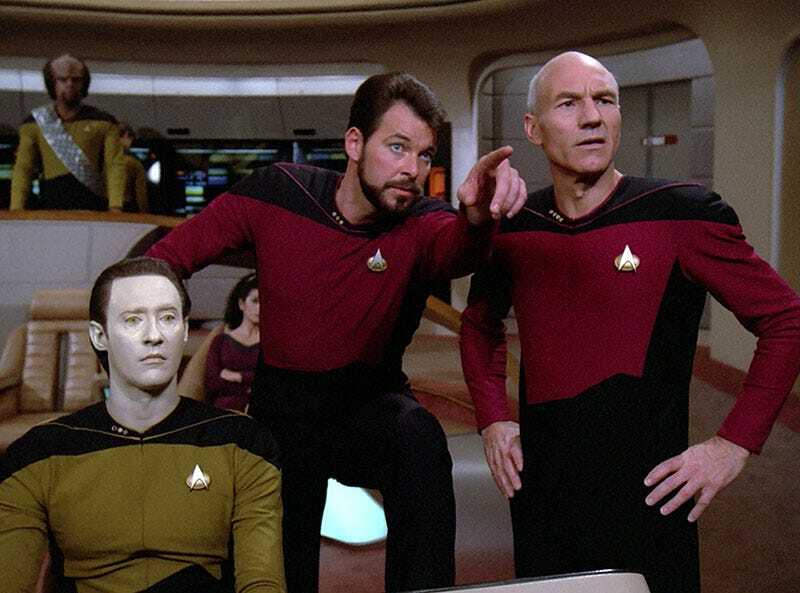 And thus we were introduced to the Jean-Luc, his best pal Q, and Riker's beard. Got to say still need to go back and restart watching from the beginning....Yup, that's the topic. Shows you thought you would not get in, but you totally did later on ^^; Or not....whatever you choose, feel free to talk about the life on the final frontier or the 3d one. SO TALK AMONGST YOURSELVES! Nope, no jam or something....Worf happened. "The Graveyard Shift is not responsible for KKHHAAANNNNN!"